The snow peas have really gone mad. We are, at last, getting some sunshine (although it is raining as I type) and now we have more snow peas than we can possibly eat. We also have more avocados and asparagus than we can eat. And soon it will be broccoli with this and broccoli with that. To today’s recipe… I went to eat your books and searched for ‘snow peas and chicken’ then ‘snow peas and pork’. I chose one recipe from each search. As it turns out, I have already posted the chicken recipe – ‘Chicken with Cashew Nuts and Snow Peas’ which we had for dinner tonight. It is a great quick stir fry. Do give it a try if you haven’t already. Last night, we had the subject of today’s post, Hoisin Pork with beans, snow peas and noodles. Coincidently, I have already posted a hoisin pork recipe – ‘Hoisin Pork with green beans’ – which is another wonderful stir fry. Today’s recipe is equally wonderful and quick but is not a stir fry. It is, however, another perfect meal for a busy week day. The recipe is from Delicious Magazine, July 2010. I have set it out below as published. The only changes I made was to halve the meat and the noodles. This made enough for two. If you are making dinner for four, I would keep everything the same but up the vegetables. Combine ginger, garlic, hoisin, honey, soy and sweet chilli in a bowl. Add the pork and coat well, then marinate for, at least, 15 minutes or as long as you like. Heat the oil in an ovenproof frying pan (make sure the pan will fit into your oven). Add the pork, reserving the marinade, and brown on all sides. Pour the marinade over the browned pork and add one tablespoon of water, cover with foil, then bake for 15-20 minutes until the pork is cooked and the sauce is sticky. Meanwhile, cook the noodles in boiling water, according to packet instructions. Add the vegetables to the noodles for the last 2-3 minutes of the cooking time, drain and toss with the sesame oil. Set aside. Remove the pork from the pan, leaving the sauce, and set aside to rest briefly. Add the noodles and vegetables to the pan and toss to coat in the remaining marinade. Put the pan back into the hot oven whilst you slice the pork. Place the noodles and vegetable mixture onto your plates. Place slices of pork on top and then garnish with chopped spring onions or chives. This entry was posted in Eating your bounty, Pork, Snow peas, Something Simple, What's for dinner? by Glenda. Bookmark the permalink. 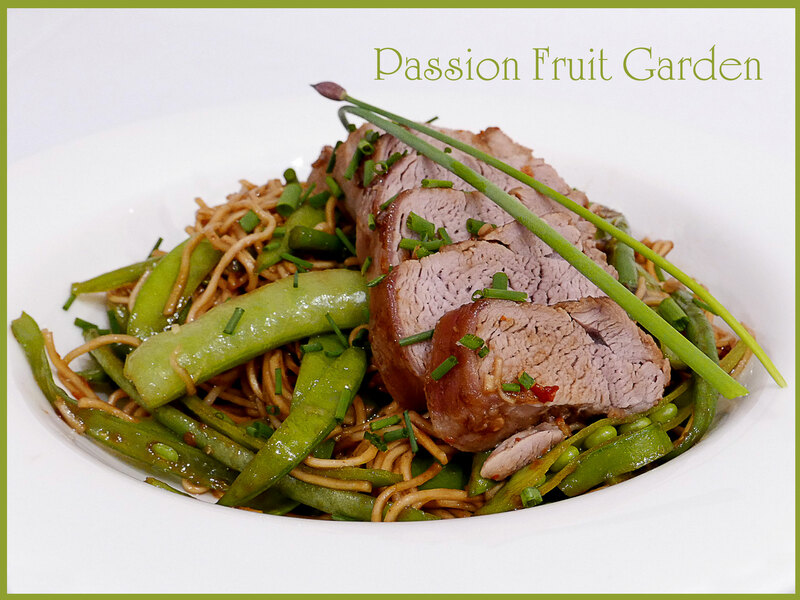 Pingback: Hoisin pork with beans, snow peas and noodles — Passion Fruit Garden…My kind of recipe… | Retired? No one told me! This sounds delicious Glenda and my kind of recipe…I love snow peas. Hi Carol, Thanks, it was wonderful and so simple. This sounds like a ‘keep’ recipe, so easy and tasty. OMG Yvonne, it is so easy. It takes no time at all. Those sauces would really add something to the pork..It’s good to find ways to eat your excess from the garden, it becomes a research exercise and then, you find the perfect recipes to match. Love snow peas. A lovely recipe, Glenda. I love this recipe. The marinade for the pork sounds delicious. Thanks Trav, It was good.